Out of the dozens of dishes I've made since my last blog entry, I decided to post this one because it was truly me on a plate: simple to make, big on flavor, slightly improvised, and Asiafied. The key here is slow-cooking the duck so the meat is tender and easily pulls apart, just like pulled pork. To make the broth for slow-braising the duck, I used coconut milk, lime, red curry, paprika, cumin, cinnamon, and chili powder. As the duck cooked, my kitchen was filled with the tantalizing aroma of a Thai curry and I almost forgot I was making tacos. 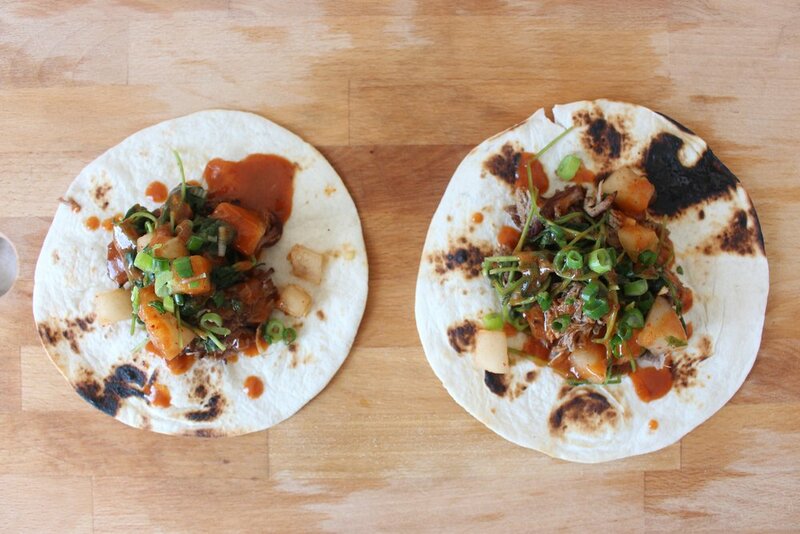 When the duck is finished cooking, I used some of the braising broth and whisked it with Gochujang to make a really tangy, delicious taco sauce. Of course, I saved the remainder of the broth and will repurpose it for something else, so stay tuned. Along with the duck, I just added a simple watercress and Asian pear kimchi that I had made for another dish the night before. One of my favorite things about cooking is repurposing, improvising, and making spin-offs of dishes — that's why it's important to always use versatile ingredients and stick to a flavor profile you know and love. Add coconut milk, lime juice, and spices to a small pot and bring to a boil. Add duck breasts and turn down heat. Let simmer for 4 to 5 hours. Add all ingredients for the kimchi in a large mixing bowl and combine well. Store away until duck is ready. Can be made ahead of time. When duck is ready, take out of the braising liquid and pull apart with a fork. Combine 2 to 3 tablespoons of the braising liquid with 1 to 2 tablespoons gochujang and mix well until a consistent sauce forms.